Comm Eye Health Vol. 30 No. 100 2018 pp 74-77. Published online 07 February 2018. Honorary Clinical Consultant: International Centre for Eye Health, London School of Hygiene & Tropical Medicine, London, UK. The number of children who are blind from eye conditions (excluding refractive error) is falling in all regions. To continue this encouraging trend, comprehensive eye care needs to be strengthened by improving referral mechanisms and counselling parents at every step. Nearly a third of the very first issue of the Community Eye Health Journal was about blinding eye diseases in children. One article described an Indian study about improving mothers’ knowledge so that they could prevent eye conditions in their children. The other article also focused on the major causes of corneal scarring in children: vitamin A deficiency (VAD) and measles infection. The issue was published two years before the first workshop on childhood blindness, which was initiated by the World Health Organization (WHO) and held in London in 1990. The workshop report reviewed what was then known about the prevalence and causes of blindness in children and estimated that there were 1.5 million blind children worldwide.1 At that time, corneal scarring – principally from VAD – was estimated to be responsible for 50–70% of blindness among children in low-income settings. Every year, there were 350,000 new cases of xerophthalmia; an estimated 60% of these children would die within a year of becoming blind. Measles infection was recognised as an important cause of vitamin A deficiency. Much has happened since then. Measles immunisation coverage (the proportion of children who have been immunised, expressed as a percentage) has increased in many countries to over 80% (Figure 1), with a marked reduction in the number of measles cases. 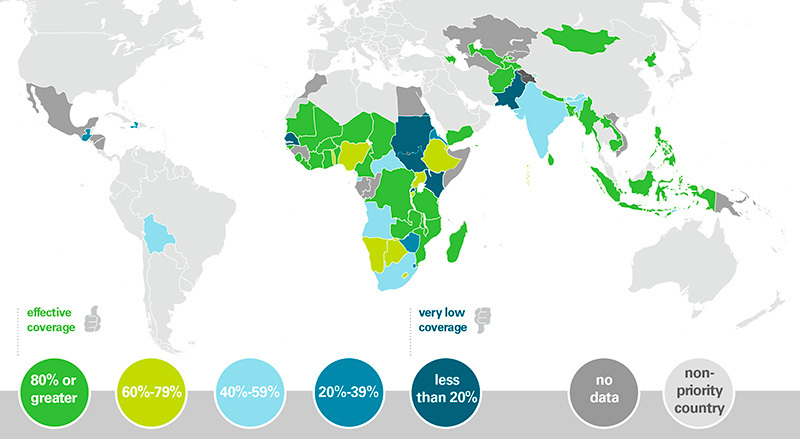 In 2015, however, there were still estimated to be over 134,000 deaths from measles.2 As can be seen in Figure 1, most countries in sub-Saharan still have immunisation coverage below the target of 80%. In the late 1980s it became clear that children with xerophthalmia had a higher mortality rate than children without the condition. This important finding led to many clinical trials of vitamin A supplementation. Trials have shown that, in communities with less than adequate nutrition, supplementation of children aged 6–59 months reduces child mortality and morbidity, and also reduces the ocular signs of vitamin A deficiency.3 Today, vitamin A supplementation (two doses per year for children aged 6–59 months) is being implemented in child health programmes in low-income countries. 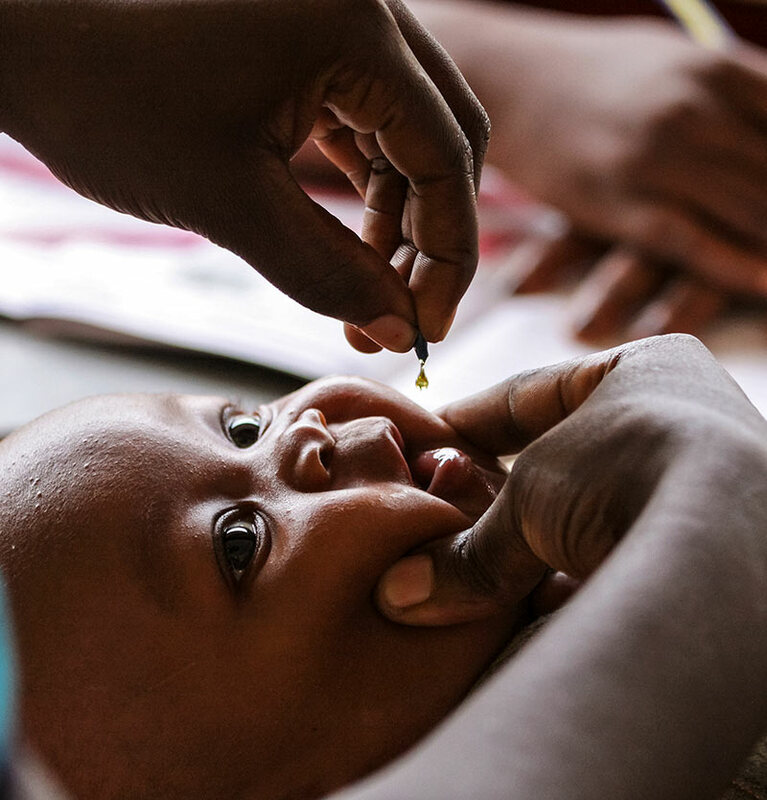 However, as with measles, vitamin A supplementation coverage is below 80% in many countries (Figure 2).4 It is important to note that other approaches to improve the nutritional status of children, including their vitamin A intake, should go hand-in-hand with supplementation. These approaches include supplemental feeding, fortification of commonly consumed foods such as oil and sugar, and breeding crops so they have a higher vitamin A content (known as biofortification). What impact have these large-scale public health initiatives had on the causes of blindness in children in low income countries? The simple answer is that they have had a major impact, with a marked decline in the proportion of blindness due to corneal scarring in many countries. However, we must not become complacent. In some countries, such as Ethiopia, corneal scarring remains the commonest cause of blindness5, and sub-clinical vitamin A deficiency in children remains endemic in many countries. Indeed, UNICEF estimates that 33% of preschool-age children and 15% of pregnant women in low income countries do not have enough vitamin A in their daily diet, and that 5.2 million preschool-age children have clinical vitamin A deficiency. More needs to be done to increase awareness in communities about the need for a vitamin A-rich diet, and to improve the coverage of vitamin A supplementation. What else has changed since 1988? The number of children in the world aged 0–15 years has increased from around 930 million in 1950 to 2 billion today. But the rate of increase is slowing, largely as a result of socio-economic development. 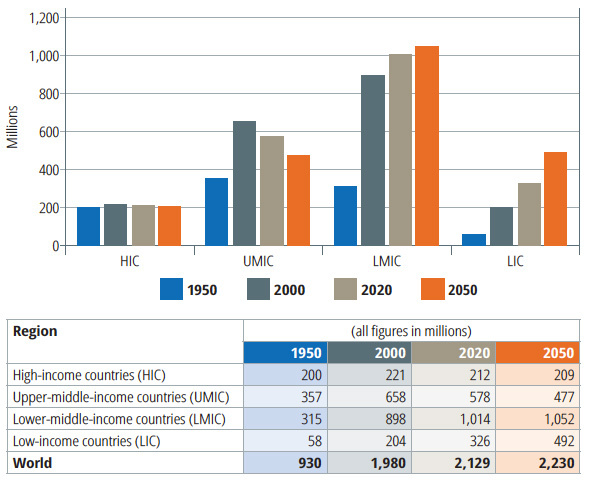 The number of children has declined in upper middle-income countries (UMIC) but is projected to continue to increase in low-income countries (LIC).6 See Figure 3. In the mid-1990s, it became clear that the prevalence of blindness in children is associated with under-five mortality rates: it is higher in countries with high under-five mortality rates, and low in countries with low under-five mortality rates. As can be seen in Figure 4, under-five mortality rates are declining in all regions. 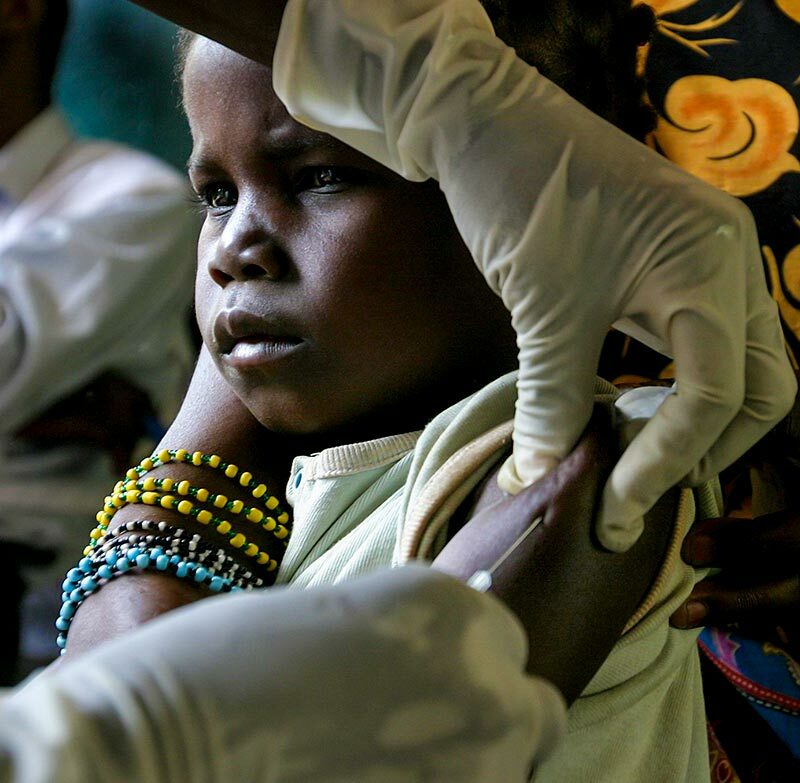 In 2005, sub-Saharan Africa had the highest under-five mortality rate compared with other regions. There has been a reduction of 24% in the number of blind children since 1990, despite the overall increase in the child population. Why is this happening? Better control of measles and vitamin A deficiency, which are both important causes of blindness, are contributing to declining under-five mortality rates (Figure 4).8 However, the overall decline in the number of blind children globally hides regional differences in the change (Figure 5). In sub-Saharan Africa, the estimated number increased between 1999 and 2010, but is now declining. In many low-income countries where corneal scarring has declined, cataract has become the commonest cause of avoidable blindness in children. Much has been done to establish tertiary eye care centres with a well trained and equipped team, and many of the larger countries now have several such child eye care centres. One of the main challenges is that affected children often present very late for surgery due to lack of awareness and cultural, social and economic barriers, which compromises the visual outcomes. There is also some evidence that, in Asian countries, girls with bilateral cataract do not access services at the same rate as boys.9 Another study from Bangladesh showed that children with better visual outcomes after cataract surgery were more likely to be in school, so cataract surgery contributes towards the Sustainable Development Goals regarding gender and education.10 More needs to be done to improve access, to ensure that children attend for follow-up after surgery, and to provide low vision services for the children who do not have good visual outcomes. Another major change over the last 20 years is that services for preterm infants have expanded dramatically, as governments realise that Under-five mortality rates will remain high unless neonatal and infant mortality rates are brought down. Neonatal care initially expanded in upper-middle income countries, particularly in Latin America and the Caribbean, in the former socialist economies, and subsequently in many Asian countries. Neonatal care has just begun to expand in Africa. However, in most countries, policies and resources were not put in place to control retinopathy of prematurity, which has led to the ‘third epidemic’ of blindness due to retinopathy of prematurity.11 A recent estimate of the annual number of infants becoming blind or visually impaired from retinopathy of prematurity shows that every region is affected, with 32,300 new cases every year.12 In middle-income countries, retinopathy of prematurity is often the commonest cause of avoidable blindness. Many of these countries have or are responding by establishing screening and treatment programmes. However, more needs to be done to increase the coverage and quality of screening and treatment and to improve the quality of neonatal care, as this will reduce the incidence of retinopathy of prematurity needing treatment. Advocacy is needed to raise awareness among ministries of health and other agencies engaged in child health. The goal is to ensure that policies and programmes, with guidelines and resources, are put in place to reduce this potentially avoidable cause of blindness. 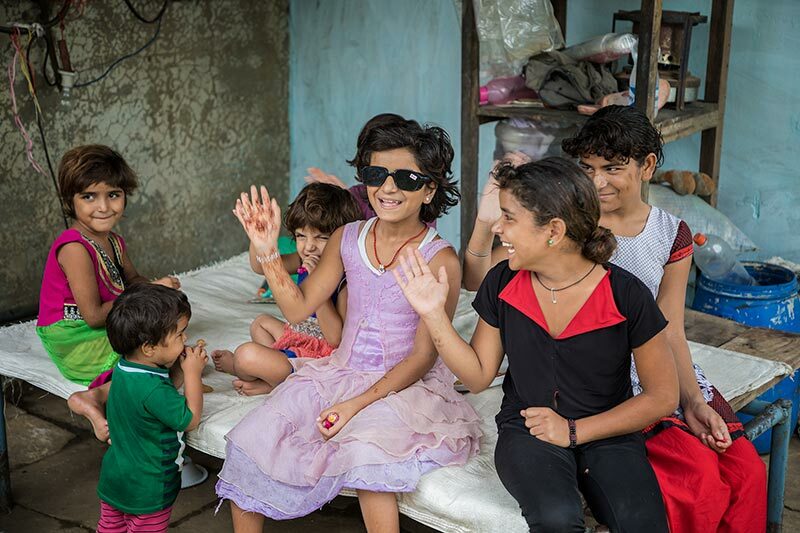 To improve child eye health and reduce disability, comprehensive services are needed at community, primary, secondary, and tertiary level, working alongside low vision, special education and rehabilitation services. Good referral mechanisms are needed to provide a continuum of care between all services (Figure 6). Raising awareness in the community about eye diseases, and how they can be prevented, is very important, as was described in the first edition of the Community Eye Health Journal. At the primary level, staff providing services for mothers and young children need to know what they can do to prevent, detect and treat and eye diseases (pp. 78-79).15 Eye care at secondary level needs to be strengthened to manage less complex cases and to follow children up after surgery. Screening and treatment of ROP can be undertaken by ophthalmologists at secondary or tertiary levels. Counselling parents at every step is of vital importance as it will help them to understand what to do and the important role they play. Much is being done to improve tertiary eye care for children, but more tertiary centres are needed; ideally one per ten million population.16 Greater emphasis is also needed on the other levels of service delivery, special education and rehabilitation; and the referral networks between them. 3. Imdad A et al. Vitamin A supplementation for preventing morbidity and mortality in children from six months to five years of age. Cochrane Database Syst Rev 2017;11;3:CD008524. doi: 10.1002/14651858.CD008524.pub3. 7. Rahi J. and Gilbert C. Epidemiology of visual impairment in children. Chapter 2. Pediatric Ophthalmology and Strabismus. 2016 4th Ed. Scott Lambert and Christopher Lyons. Saunders, Elsevier Ltd, London. 8. GBD 2015 Child Mortality Collaborators. Global, regional, national, and selected subnational levels of stillbirths, neonatal, infant, and under-5 mortality, 1980–2015: a systematic analysis for the Global Burden of Disease Study 2015. Lancet 2016; 388:1725-74. 9. Gilbert CE and Lavier-Chomet N. Gender inequalities in surgery for bilateral cataract among children in low-income countries. Ophthalmology, 2016 Mar 15. pii: S0161-6420(16)00154-8. doi: 10.1016/j.ophtha.2016.01.048. 10. Negretti GS. et al. Cataract surgery outcomes in Bangladeshi children. Ophthalmology. 2015 May;122(5):882-7. 11. Gilbert C et al. Retinopathy of prematurity in middle-income countries. The Lancet 1997;350:12-14. 12. Blencowe H et al. Beyond newborn survival: Paper 3. Preterm associated visual impairment and estimates of retinopathy of prematurity at regional and global level for 2010. Pediatric Research 2013;54: 36-49. 13. Aghaji A et al. Causes and emerging trends of childhood blindness: findings from schools for the blind in Southeast Nigeria. Br J Ophthalmol 2015;99:727–31. 15. Malik ANJ et al. Integrating primary eye care into global child health policies. Arch Dis Child. 2017 Oct 7. pii: archdischild-2017-313536. doi: 10.1136/archdischild-2017-313536. Epub ahead of print. 16. Agarwal PK. Et al. Child Eye Health Tertiary Facilities in Africa. J AAPOS. 2010 Jun;14(3):263-6. doi: 10.1016/j.jaapos.2010.02.007. Imdad A, et al. Vitamin A supplementation for preventing morbidity and mortality in children from six months to five years of age. Cochrane Database Syst Rev. 2017;11(3):CD008524. Mulusew A, et al. Causes of severe visual impairment and blindness in students in schools for the blind in Northwest Ethiopia. BMJ Glob Health 2017;2:e000264. Negretti GS, et al. Cataract surgery outcomes in Bangladeshi children. Ophthalmic 2015;122(5):882-7. Aghaji A, et al. Causes and emerging trends of childhood blindness: findings from schools for the blind in Southeast Nigeria. Br J Ophthalmol 2015;99:727–31. Malik ANJ, Mafwiri M, Gilbert C. Integrating primary eye care into global child health policies. Arch Dis Child. 2017 Oct 7. Epub ahead of print.